75,000 B.C. to 52,010 B.C. Top of page: Spirit and Nature ~ Humanity (the Giants of Yore) recover lost Knowledge, Understanding and technology. Middle: The Earth and it's inhabitants; Human, animal, plant, mineral, and non-physical beings, all bask in the Glow of a new Golden Era. 1st 'modern' period of Knowledge, Understanding and technology. Bottom of page: The long lasting beneficial effects of the Satya Yuga begin to fade, with this comes increasing lack of discernment, lack of understanding, and 'animal problems'. 75,000 B.C.~ Descriptions of the second world (the 'second Earth'). Humanity consisting of giants and titans recovers from the Great Decline, the loss of knowledge of the original (native) Earth Human civilizations. The original kings, queens, Sages and Saints of the first world are long gone. A recovery of knowledge, health, Understanding and life itself. Prior to the wars and destructions of the future, the EARTH in these times was very lush, fertile, and vibrant planet-wide. There were no true deserts. Seas and oceans were shallow, with no deep trenches and only a third of the salt content as compared to the present. Storms, tornado's, hurricanes, lightning, droughts, and monsoon torrents were unknown. There were no permanent glaciers along with very little snow, cold and winter as we know it now, and these types of weather were only found near the polar regions, or on top of the tallest volcano's witihin 500 miles of the poles. Very few volcano's existed then, and earthquakes were almost nil. Since there were no torrent nor monsoon types rains, there were no floods. The the morning mists and dews were like Manna, and these generously watered the vast flora, along with occasional showers. As mentioned in other areas on this site, the atmospheric manifold kept cosmic rays, ultraviolet radiation, and other potentially harmful spectra from the mostly flat lands. The manifold provided a rich air, high in oxygen, that felt alive in itself. Mountain ranges as we know them now did not exist. The tallest mountains of this time period (usually a volcano) rose skyward no higher than 4,000 meters. The 'gravity field' was less yet the planet then had more mass, which combined with the manifold allowed for giant life forms. Plant Life, nourished by the atmospheric manifold with its peculiar mix of atmospheric gases, plus the radiant life force emanating from the planet, nourished giant trees, ferns, grasses and aquatic flora. Decidous trees such as we have now, did not exist then. 98%+ of plant life then was evergreen, as there were no seasons as we have them now. Animals, rising up to eat these giant plants, and breathing this atomsphere, also grew large. Dinosaurs grew to tremendous size, even larger than we have been aware of now. Those that were plant eaters had plenty to eat about everwhere. There were no barren polar areas then, nor deserts, although the poles were slightly cooler than the rest of the earth. Information, understanding, and technology re~emerges. Humanity then, giants compared to us size now, regained the dominion of themSelves, and so doing regained a dominion over the Earth. Explorations of the 5 continents of 70,000 B.C. The Second rise of Atlantis: The recovery of knowledge after the Great Decline. The Original kings, queens and giants of Atlantis, including the First Kings Poseidon and Atlas were long gone. The knowledge of the first Atlantean civilization and all other earlier Earth civilizations had been lost through a long period of attrition of both mind and Idea. Then, as in all time periods after a loss of ideas and knowledge, the problem was one of energy, one of power. How does one energize technology, how does one energize machines? How do civilizations, countries, continents, cities in earth, upon earth, within oceans, seas and of sky and space energize, power, or move that which needs to move? How does one power a transportation system? One might as well ask the secret to what powers this Universe. The scientists and sages of this 2nd period Atlantis and Earth asked these and similar questions, and the first answer found, was of using the natural energies of the planet, of creation. One name for this 'energy' is the 'Grid' system of power and transportation. The Gridwork of Ley Line is rebuilt. Before the construction of the Great Crystal, the discovery of planetary lines of Cosmodyne force, which we in this present era call Ley Lines, was rediscovered. Earths own geometry (of that time period) was found to naturally amplify (or negate) these bundles of primordial energetics. Some of these above were found to be in an 'unfocused' state, while other areas fairly 'thrummed' with power. Humanity of the time began building specific geometric shapes, such as Pyramids, Dolmens, Ovals, and Loops, that either modified or focused these Flows of natural energy. Further discoveries of Frequency, magnetic, phototonic and other activational anglarities added to Human's ability to use this 'Grid' system. Finally, it was discovered the evolved Humans themselves were the highest modifiers of the Ley Lines, and that the Human body was subject to an 'upgrade' process while within these Ley Lines and other areas of spiraling power. ECLIPSES AND CERTAIN OTHER CELESTIAL EVENTS (INCLUDING SUNSPOTS) COULD PERIODICALLY POWER DOWN (OR OVERLOAD, IN THE CASE OF SUNSPOTS) THE WHOLE SYSTEM. THE ASTRONOMERS, ASTROLOGERS AND MATHMETICIANS OF THAT TIME PERIOD WORKED TOGETHER TO INSURE OPTIMUM FUNCTIONING OF THE SYSTEM AND WARN THE PUBLIC OF 'SHUT DOWN' TIMES, WHICH COULD BE POTENTIALLY DISASTEROUS IF ONE WAS IN TRANSPORT. The return of the E.T.'s! E.T. beings, having already observed or interacted with Earth and it's life forms in the past, observed increased activity, e/m emanations, and other signs of reviving civilization, and being naturally curious (along with some groups with additional agenda's, decided to investigate, and again interact. The most notable of these imported techs was the Giant Power Crystal of the Atlanteans! This Great Crystal would eventually supplant the grid system, which the E.T. 's had been so interested in, in the first place. The Original uses of the Great Crystal were, like the Grid/Ley Line system, beneficial. Not just to humanity, but to plants, animals, minerals and the movement of Planetary Life energy ("Orgone", "Chi", "Zero Point" etc). The Great Crystal itself was in a way a part of Solar/Planetary energetics. Yet the crystal was also semi-autonomous, and advanced, in it's function. At first, the Crystal only had significant powering functions during the Solar Day of the Atlantean plain where it was constructed/grown. The Grid/Ley line system, when first mapped out during the original Earth civilization of Poseidon, Atlas, and other very highly functioning human beings (demi-Gods), was also at first semi depentant on the Solar day. The Atlanteans of this time period, with the advice of the E.T. groups who had brought this technology to Earth did many experiments both on and with the Great Crystal. They did obseve that while not able to be a source of power at night, there was indeed residual power stored throughout the Crystalline complex at night. The whole complex acted as a giant Capacitor at night, though at first this was not able to be used in any functional way. The other limitation to the Great Cyrstal was even at full power during local Atlantean Solar noon, only devices, ships, disks, A.I. type devices, networks and small transceiving crystals in the same Earth hemisphere as Atlantis were able to powered or otherwise energized/useful. Even small pure crystals with no load, if located opposite of Atlantis around the globe, were not significantly energized. The only later development/upgrade in this era of time was that eventually, small bits of communications (and/or the empowerment of very small devices) could go through the crystalline network, on the other side of the Earth. glyph, that was considered Divine in origin. like the rest had Divine Origins. Out of the 5 original Lands (continents) of Modern Humans, Africa is the one continent that not only was (mostly) not bombed (and not humanly altered), but also gained the most land mass (as a separate continent), during the great land mass alteration of the Great Flood and after the Mahabharata/Atlantean World War! was the original land of the 4th appearing, Adam and Eve. Gobi, an original continent, was washed over and altered during the 1st Lemurian/Atlantean Cataclysm of 52,010 B.C. (see next page); bombed, rayed, destroyed and finally flooded by the Great Global Flood of 28,500 B.C. (see page 7); and also bombed, flooded and had major land mass alterations (during the Mahabharata/Atlantean World War of 10,000 B.C.) that changed Gobi into today's Mongolia, China, and a few other lands (of that area) of present day Earth (see Pages 10 and 11). More descriptions ! The 4th appearing Adam and Eve were Yellow in color, and like the rest had Divine Origins. ('Hyderborea', and known by other names also); also the later land of Cimmeria! Hyperborea existed in two distinct 'sizes' (similar to Atlantis existing in 3 distinct sizes). Its first and Original size was a continental size land mass that existed where the Polar Sea exists today above Russia, extending south into what is the Caucuses mountain chain. Hyperborea also extended south and west into todays Scandanavia, and even partially out into todays North Sea, above the British Isles. It 'overlaps' into what is today Central and Northwestern Russia, also parts of Scandanavia. The 5th appearing Adam and Eve (white) originated in the southern Caucuses area, of what was then Hyperborea. 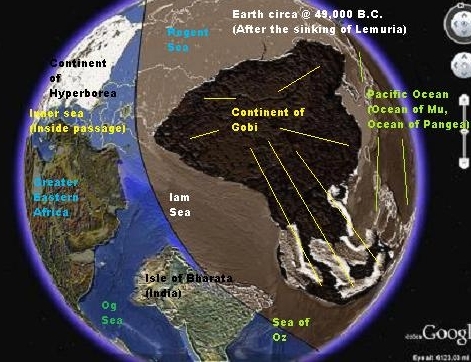 During the first Global Cataclysm of 52,010 B.C., Hyperborea was cracked in half, with significant portions of that continent subsiding under the sea, similar as to what happened to Atlantis at that time. The Farthest Eastern and Northern portions were lost, many coastal areas flooded, and quakes and the later storms significantly altered the landscape. Prior to 52,010 B.C., the Caucuses area was flat, and only 100 to 200 meters above sea level. The first Cataclysm caused a land uplift in that area. The Second size of Hyperborea (52,010 B.C. to 28,500 B.C.) was then much reduced, similar in land area comparable to todays Australia. It still included the Caucuses area, extending North and West to include Scandavia, and also extending out into the North Sea. Technically, like Atlantis of this same period, it was a physically divided land, with a waterway and also had an 'inland sea'. After the land recovered from the quakes and storms of the first cataclysm, the land was again lush and green and fruitful, as was Atlantis and most of the other lands of Earth of this Pre Flood era. As stated elsewhere, The Pre Flood Earth was much more nurturing, lush, green, and fruitfull, as compared to present day Earth. The Great Flood of 28,500 B.C.changed everthing upon the Earth, Oceans and Seas where land once was, and vice versa. High mountain ranges and volcanos where none used to exist. During the Great Flood, Hyperborea ceased to be any separate above sea level land mass, with the Caucuses and Scandanavia area becoming part of new land forms. Parts of Scandanavia became a part of a 'new' land, extending out into the North Sea, and it became to be known as Cimmeria! The Caucuses area uplifted into a mountain range (during the Great Flood), and became part of a greater size emerging land, now known as Greater Russia! Cimmeria, as a land and Country, existed post Great Flood of 28,500 B.C. until the Atlantean/Mahabharata World War and subsequant Earth changes of 10,000 B.C! Cimmeria, as a land, covered parts of todays Scandavaia, extending out into the North Sea area. The World War of 10,000 B.C. using advanced weapons, tiggered Earth changes and great Storms that uplifted parts of Scandanavia, and sunk the western lands of Cimmeria under the now larger North Sea. Bombing, the cataclysmic uplifting of mountains, and tsunami's and land sinking destroyed the civilization of Cimmeria. Ancestors of Cimmerians of that time included larger numbers of 'ex pat' Atlanteans, some peoples from both India and Gobi, and those that eventually migrated away from the Caucuses area. These migrations occured sometime after the 'Tower of Babel'event (see elsewhen in this website), after humanity had gone through another 'dark era'. Present day Scandanavia came to exist after Earth changes (caused by War) that sunk, altered, and broke up Cimmeria. Earth, now governed by enlightened giant human beings, is as like a heavenly planet~ for a time. The effects of the Descending Yuga begin to appear. The sinking of Lemuria and the cracking and division of the original size Atlantis is Seen by Oracles and Seers. Those giants (humans of then normal size) then living on this version of Earth understood the cyclical nature of the Yuga cycles, and thus inner work and preparations began to be made, then implemented. <t.b.a.> So with the Atlanteans now helping the Lemurians try to solve their problems of Marauding Animals and overgrown Jungle, the Atlantean scientist found a technology that their Great King Poseidon had experimented and used (a little), so long ago. It was a 'Gamma' type Nuclear device, small scale, but very affective with in its target zone. (This device is only somewhat similar to what we have today). The records from Great King Poseidons time were not complete, and were somewhat damaged, but the lack of information just made the Atlanteans more determined to make this tech work. The spiritual leaders and Shamen/ness also began to feel uneasy about the Atlanteans help, but they didnt know why, at least at first. The Spiritual leaders and Shamen/ess had also long known that the 'foundation' (continental uplift pressure) for Lemuria, deep down in the Earth in the semi liquid part of the core, was not stable. The Nature Spirits and Earth elementals also whispered that Earth her self, was pondering change, especially since the Lemurians no longer 'cared' about the land. (The Lemurians had become Apathetic towards change for the better). Even before the Atlanteans tried to help, the Lemurian continent began shaking, and the Volcano's began erupting. Poisoness gases began crossing some areas of land. The zealous Atlanteans bought in 20 'small yield' Nuclear 'Gamma' type devices. 20 was also the number of Large Animal (Valley size Nests of Mastodons, Mammoths, and Dinosaurs), spread widely apart upon the huge Lemurian continent. Of necessity the Lemurians had long ago vacated these areas, so there would be mimimal harm to Human life. In Atlantis, scientist and Seers, still moved by Compassion, begin to act. So the Holy Men and Woman who lived in Atlantis at that time WARNED of trying to help Lemuria, in the way the scientists wanted. 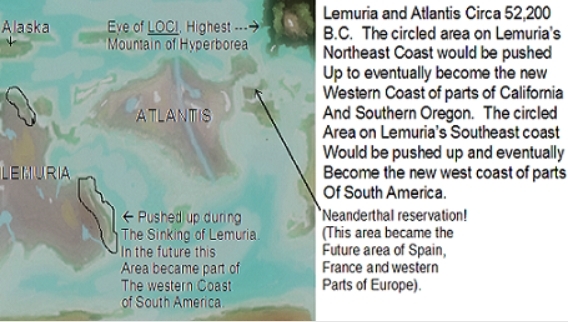 The SEERS warned that even without Atlantean help, Lemuria itself was in danger, but NOT FROM THE ANIMALS. As far as the majority of Lemurians and Atlanteans were concerned, the ANIMALS were the problem. What the Seers were trying to say though, is that the ANIMALS were just the WARNING DEVICE to the real problems of the land, ESPECIALLY the ATTITUDES (thought patterns and collective INTELLIGENCE) of the Lemurians, and even the ATLANTEANS! TO MUCH NEGATIVE OR 'STUCK' THINKING, OR GRADUALLY INCREASING ERRORS IN INTELLIGENCE (due to the Solar system once again swinging AWAY FROM THE GREAT CENTRAL SUN, the SOURCE OF LIFE and INTELLIGENCE IN THIS SOLAR SYSTEM! The Seers, further looking into the corridors of time, saw that OTHER GREAT SOLAR AND PLANENTARY WARS HAD ALREADY OCCURED IN THIS SOLAR SYSTEM LONG AGO, IN PART DUE TO THE WANE OF THE LIGHT OF THE GREAT CENTRAL SUN, AND ITS AFFECT UPON INTELLIGENCE! (see Mars link on first page!). But of course they DIDN'T LISTEN TO THESE SOURCES OF INFORMATION AND WARNING, AND SO THE WHEELS OF CHANGE WERE NOW BEING SET IN MOTION!